Joan DeRosear | Gerth Funeral Service, Inc.
Joan DeRosear, 88, of Memphis died Sunday, March 31, 2019 at Scotland County Hospital in Memphis. She was born Kathryn Joan Fetters, the daughter of John & Mary Cecelia (Delaney) Fetters on December 22, 1930 in Ft. Madison, Iowa. Joan married Dwight A. DeRosear on August 8, 1952 in St. Mary’s Church in Adair, MO. He survives. She worked at the Leach Hatchery, Hendrick’s Drug Store, in the office of Judge Richard E. Webber, Jackie’s Auto Sales and was the Scotland County Collector for 16 years. Joan was a member of the St. John’s Catholic Church in Memphis and the Ladies Guild there, the Ladies Auxiliary of the Wallace W. Gillespie Memorial V.F.W. Post #4958 of Memphis, the Baring Country Club and the Scotland County Democratic Party. Joan loved her family, and found no greater joy than when all of her children were home. She was most happy when her family and friends were gathered around her table enjoying a cup of coffee (or a cocktail!). She was a fantastic cook – especially known for her cinnamon rolls which she wasn’t ever sure were quite good enough. Joan was renowned for her homemade noodles, whether from her kitchen or the ones she made with the Ladies Guild of St. John’s. She enjoyed church activities with her parish family. 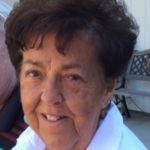 Joan was an avid bridge player and lover of the sun and being outdoors. She was an active supporter of many Catholic Charities and often gave anonymously to people in need. She was preceded in death by her parents, John and Mayme Fetters; in laws: Fred and Mable DeRosear; her grandson, Joel DeRosear; sisters and brothers-in-law: Mary and Jess Rockhold, Lois and Bob Ross, Ellen and Ted Gundy, and Dean and Margie DeRosear. She is survived by her husband, Dwight, of the home; children: Bridget (Dr. Robert) Megna of Forney, TX, Eric (Walla) DeRosear of Baring, MO, Ann (David) Gray of Kirksville, Denise (George) Kramer of Forney, TX, David (Melody) DeRosear of Belton, MO, and Gretchen (Tim) Melvin of Quincy, IL; sisters, Elizabeth Fetters (Irene Kazwara) and Mildred (Ron) Klem, all of Memphis; a brother, John (Marilyn) Fetters of Kahoka; grandchildren: Seth Thomas, John Megna, Blake DeRosear, and Colin, Jonathan and Landon Melvin; great-grandchildren Miles and Madelyn Thomas; numerous nieces, nephews, cousins and friends – including a special friend, Linda Bell and her family. So sorry to hear of Joan’s passing. Our thoughts and prayers are with you. I am so sorry to hear of Joan’s passing. She was such a wonderful, carring person. I am so blessed to have known her. I will keep all of you in my prayers. Joan will be remembered in our hearts as a beautiful, kind, and charming lady. She always made us feel welcome when we were with her. A truly wonderful person. We are very sorry to hear of Joan’s passing. Our thoughts and prayers are with the family. So sorry that Joan is no longer physically with you. Be comforted to know that she has returned to God from whence she came. May my prayers and the prayers of others be of comfort to you. I am so sorry to hear of Joan’s passing. May God grant you peace, comfort and strength as you say your good-byes. You were blessed to have her and each other to call your family. So very sorry to here of Joan’s passing thoughts . comfort and prayers to the DeRosear family! We loved Joan and always loved to be with her and Dwight. She will be missed. I am so sorry to hear Joan passed away. Please know my thoughts and prayers are with you all at this difficult time. The Schaefers have such fond memories of times spent with the DeRosear family and am reminded of so much laughter around the table. Rest In Peace sweet lady. She will be greatly missed by so many. She is now in Heaven with her sisters Ellen and Mary. I am thinking of all of you at this difficult time. Aunt Joan was so thoughtful, loving and caring, the most wonderful person. I have so many good memories of her. We are so sorry to hear of Joan’s passing. We have such good memories of being with her and Dwight when he & Harold were in the army. Also got to visit in their home when they were discharged. Our thoughts and prayers are with you Dwight and all your family. Our thoughts and prayers are with you Ann, and with all your family. We were so sorry to hear of your Mom’s passing. We know she was a special lady because of the wonderful person you are. Peace to you this week with all you must do. We will keep you in our prayers. Sending light and love to the family. Prayers for your family. Joan will always be remembered for her kindness and caring for everyone. Cherish your memories with her and may you find comfort in those times together. Heaven has gained another beautiful angel! Praying for you and the family. Love you! Sorry to hear of your Mother’s passing. We’ll be thinking of you all. So sorry for your loss Joann was a wonderful person and my friend. So sorry to hear of the passing of your mother. Many prayers and love to your family. So very sorry for your loss. Joan was such an outgoing vivacious person. Her laughter was contagious and she was always so kind. Prayers and hugs to all family members. God Bless. Eric and Walla I am so sorry to hear about your mom. Please know you are all in my thoughts and prayers. I am sending love and prayer to you all during this difficult time. So sorry for your loss. Sending my thoughts and prayers to Dwight and family. I loved having Joan for my bridge partner! She was also the easiest person to talk with – and the least judgemental. The hostess with the mostest! I already miss her presence. Sorry to hear of Joan’s passing. I will keep her and the family in my prayers. We had some really good times together. R.I. P Joan. I am so very sorry to hear of Joan’s passing. She welcomed me to Memphis with open arms and into her home where we enjoyed “cocktails” and many, many laughs. She never knew a stranger. I love her and will miss her dearly. My sincerest sympathies to her incredible family. Love you all. Words cannot describe how sorry I am of Joan’s passing. She was a wonderful lady and the kindest of persons. My deepest sympathy to her family. My thoughts and prayers are with you at this time. Dwight and Family, You are in our thoughts and prayers. Many good memories at the Baring Lake. Still use her cabbage roll recipe. Such a good cook. She will always be remembered. Our deepest sympathy to you all. Thinking and praying for you all! Words cannot express how sorry I am to hear of Joan’s passing. She was a wonderful, kind and generous Lady, I’ll always remember as a good friend. I will keep Joan and her family in my thoughts and prayers. So sorry to hear of Joan ‘s passing . Your family is in our prayers. Thinking of you all in this difficult time .